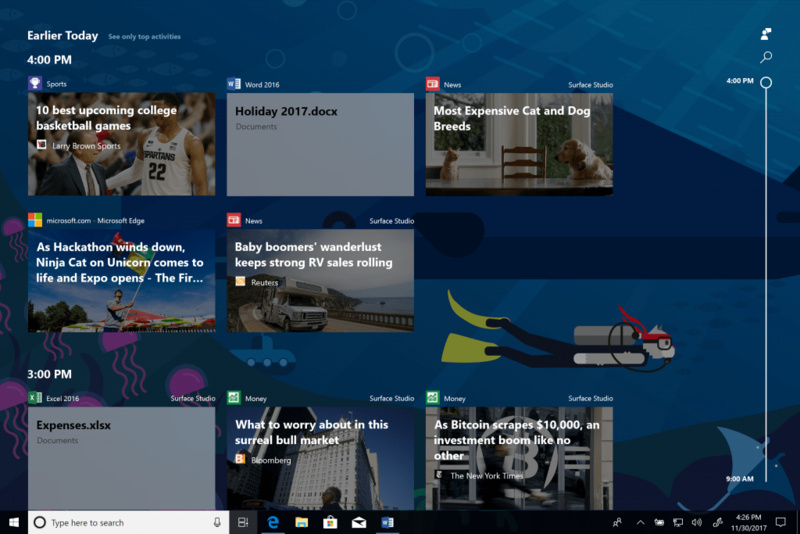 Microsoft releases Windows 10’s next major update in the Windows 10 April 2018 Update. The free update focuses on helping you save time finding things you’ve been working on and getting back to it. It also helps reduce distractions so you can keep your focus on what really matters and get things done. All of these new features have been in testing by Windows Insiders worldwide. So if you are an insider you will be familiar with some of these. On the other hand if you aren’t then soon the update will be hitting your PC. Microsoft will be rolling this update slowly starting with newer devices first and then older ones. But if you can’t wait and want it now there’s what you can do. The guys over at Windows Central have put together some of the common problems and fixes you might encounter in a post. Returning to past activities in your timeline and continue your recent activities instantly in your timeline. Select Task View on the taskbar(by start or Cortana) or press Windows logo + Tab keys. Share files with people and devices near you, over wifi and Bluetooth easily. Open Photos and select the picture you want to share. Select share, then select the PC you want to share it to. On the other PC, select Save & Open when the notification appears. Start browsing the web, writing emails, and using apps on your phone, then continue on your PC, instantly. Add your phone in Windows settings, Phone. Do you remember quiet hours from windows mobile? Then you have an idea what Focus assist is. It helps you kind of zone out on every other thing and finish off a project or work. So it hides distractions while you work. Turn on focus assist to send notifications directly to action center. Select action center on the taskbar, focus assist. Microsoft is making speech to text very natural and a thing. Use Windows key + H in a text field in Windows 10 or in an app and start talking. You can now easily take a note with your voice. On the touch keyboard, select microphone on a physical keyboard, press Windows logo key + H to dictate what’s on your mind. These are to mention a few. Edge has lots of update. Accessibility updates are also in the mix. Photos, videos, Remix 3D apps have interesting features including 3D and mixed reality.